Superintendent Dave Taylor planned to "bring down" former Garda Commissioner Nóirín O'Sullivan, her predecessor Martin Callinan has alleged. The Disclosures Tribunal has heard Mr Callinan claim the conversation took place at his home in 2015, some time after Supt Taylor was arrested during an inquiry into the alleged unauthorised disclosure of information to journalists. Mr Callinan is scheduled to give evidence today. Garda counsel Micheál P O'Higgins SC, said Mr Callinan had made a statement saying Supt Taylor told him "he would bring her down because of what she had done". Supt Taylor denied the allegation. He also rejected a claim by Mr O'Higgins that at the time he had "lost his balance" and was making "wild allegations" about Ms O'Sullivan. The tribunal has previously heard how Supt Taylor was said to have been "gutted" after Ms O'Sullivan transferred him from the garda press office to the traffic bureau in June 2014. The following year he was arrested and suspended after being placed under investigation for the alleged leaking of unauthorised information. No charges resulted from the inquiry, but Supt Taylor accepted yesterday he had been passing information to journalists. While that inquiry was ongoing, Supt Taylor criticised his treatment by investigating officers, but under questioning yesterday he accepted Chief Supt Frank Clerkin, who led the inquiry, had done a professional job. In September 2016, while still under suspension, he made a protected disclosure alleging Mr Callinan ordered him to negatively brief journalists about penalty points whistleblower Maurice McCabe and that Ms O'Sullivan had knowledge of the smear campaign. The accusations are denied by Mr Callinan and Ms O'Sullivan. Mr O'Higgins put it to Supt Taylor that the protected disclosure was part of a plan to shield himself from criminal and disciplinary proceedings. The barrister alleged Supt Taylor decided to portray himself as a victim and to align himself with Sgt McCabe. He said Supt Taylor "had attempted to sell to Sgt McCabe what were a load of lies" and then "hawked around" those lies to journalists and politicians. The purpose of this, he alleged, was to undermine Ms O'Sullivan and as part of that he had to attach Mr Callinan. But Supt Taylor did not accept that his protected disclosure was "not the truth". Tribunal chairman Mr Justice Peter Charleton said Supt Taylor "had a problem" with Ms O'Sullivan and asked what the problem was. Supt Taylor said he felt he was removed from the press office when he had been doing a good job. He denied being bitter about it but said it was a public move from a high-profile position to a less high-profile one. Referring to suspicions that Supt Taylor had passed garda critical incident reports about various matters, including rapes, to journalists, the judge said Supt Taylor had been "breaking the garda code left right and centre every single day almost for a period of over a year". Supt Taylor replied: "It is of extreme regret to me and, as I said, I have to live with that now after this tribunal is over." Earlier, Supt Taylor said Mr Callinan was "extremely annoyed and extremely angry" after a journalist called to his home in 2013 before publishing an article in the Irish Independent saying the commissioner had penalty points quashed. 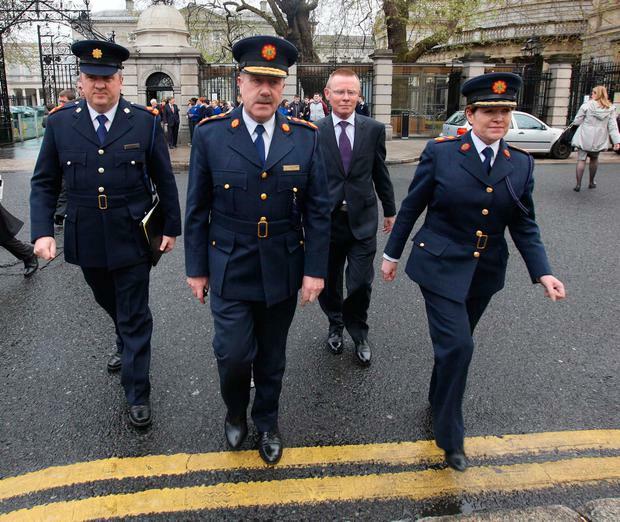 Questioned by John Berry BL, for Gemma O'Doherty, Supt Taylor said Mr Callinan asked him to contact management at Independent News & Media (INM) to express his annoyance and to convey that journalists should make queries via the garda press office. Supt Taylor said he and then Assistant Commissioner John Twomey met with then INM managing editor Michael Denieffe. He said the meeting was held in Mr Twomey's office at Harcourt Square rather than at garda headquarters as Mr Callinan was "a protected person" and Mr Twomey was in charge of personal protection and the security of Mr Callinan's home.